Jenna may hail from the ’burbs of New Jersey, but Green Teen activism is her life. So when her mom suggests they spend the summer at Grandma’s Florida condo, Jenna pleads instead to visit her hippie godmother, Susie, up in rural Canada. Jenna is psyched at the chance to commune with this nature she’s heard about — and the cute, plaidwearing boys she’s certain must roam there. But after a few run-ins with local wildlife (from a larger-than-life moose to Susie’s sullen Goth stepdaughter to a hot but hostile boy named Reeve), Jenna gets the idea that her long-held ideals, like vegetarianism and conservation, don’t play so well with this population of real outdoorsmen. A dusty survival guide offers Jenna amusing tips on navigating the wilderness — but can she learn to navigate the turns of her heart? I picked up this book while browsing the bargain shelves at Chapters one day. Something about the main character being an environmentalist and choosing to spend her summer in some far-off, rural town in British Columbia, Canada had me wanting to read more. It’s not every day that I read a book that’s set in Canada, let alone in an area that I know quite well. And I’ve always enjoyed a good summer story where the kids (or teen in this case) get to go off and spend their entire summer somewhere fun and exciting! I mean, seriously, we were never sent anywhere in the summers, save for a week at a summer camp. This book was great for so many reasons. You have your main character Jenna, who is passionate about something other than just boys and summer tans. Her enthusiasm over being eco-friendly was over the top at times, but you couldn’t help but love her for it. Jenna’s identified herself as a ‘Green Teen’ for a few years now so it’s “who she is”, but can she find a way to fit-in and still be true to herself and her values? Then you have the polar-opposite of Jenna, in her godmother’s stepdaughter, Fiona – a sullen, snotty girl if I ever have met one. I couldn’t stand her at times, but she does grow on you as her character evolves. While I am the type of person that would probably get on the next plane back home rather than deal with the likes of a person like Fiona, I admired Jenna for her perseverance in not backing down to Fiona’s hostile attitude. And while there is an unfolding love story in the pages, Boys, Bears, and a Serious Pair of Hiking Boots is about so much more than falling in love. The teens in this book felt real because the circumstances in their lives dealt with real issues – and often – relatable issues. And then we also have the outdoors! And not just the outdoors, but activities in the outdoors! There’s hiking, mountain biking, kayaking, fishing, and mountain climbing – it definitely made me homesick for the beautiful outdoors of BC. And as inexperienced as Jenna was with these activities, she didn’t let it stop her from tagging along. She even goes so far as to purchase a wilderness survival guide which will help her navigate the great outdoors, as much as it will her personal life. The only thing that bugged me about this book was the moody and unwelcoming attitude of the boys that Jenna tries to befriend when she first arrives in BC. I expect this attitude from girls, but not from guys. I’ve always found it easier to make friends with guys, so I think this is why it bugged me as I couldn’t relate to their hostile attitudes. As we learn more about these characters, you can sort of see why they are the way they are, but I still think it was a bit extreme. 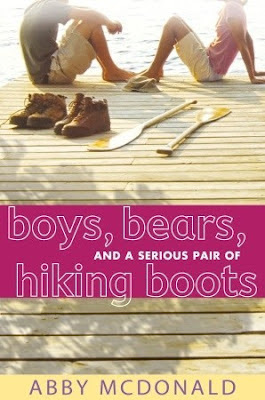 Thankfully, every character gets a chance to grow in Boys, Bears, and a Serious Pair of Hiking Boots. And while the argument could be made that too much character development happened too quickly, I for one do believe that sometimes all it takes to change a young teen, is the length of the summer. Think about many times you would go back to school in the fall and the friends you thought you had and knew, had completely changed. Overall, this was a quick and enjoyable read, one that made me nostalgic for summers past and the “great outdoors” of beautiful British Columbia. I should bump this up on my list ... might be a good read for November when I'm done with all the scary books.